“All the options were too snowy, and I’m too old and wise for wading,” Andy Nisbet writes. “Steve Perry and I had a couple of scores to settle from earlier in the winter but neither looked promising. So the old adage is that if the snow is too deep, drive to the opposite end of the country to find less. So on March 4, Ben Hope it was. Steve used to live up there and knew the mountain so he was keen. Grass growing in the middle of the road; I love it; it means you’re somewhere properly remote. It’s a childhood memory; we used to go camping in the Highlands, and not many families had cars in the 1950s. So I used to watch out for grass in the middle of the road, and then you had arrived, as had we at Ben Hope. 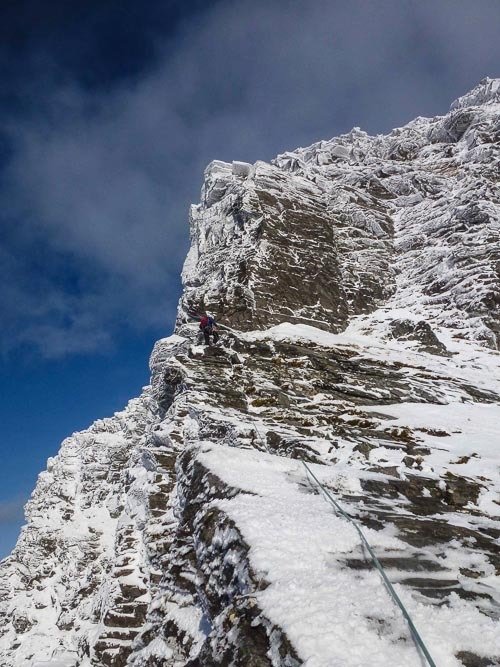 The target was Tower Ridge, the upper part of which Steve had climbed with wife Katie in 2014, but conditions hadn’t been full winter and there was a lot more climbing on the lower part. Plus Steve was keen on climbing the Tower itself, something he’d tried on the day but there wasn’t enough snow. Conditions did look good, with the west side white but blown clear of the deep snow deposited on the east side. The ridge starts low down, so it was a nice short walk and soon we were trying to decide where to start. The route would be long so we were hoping to solo up quite a way. Despite this, we fortunately resisted some easier heathery ground to the left and headed for the harder looking true crest. But it turned out to be OK and we zigzagged through a couple of tiers to a steep section and the need for the rope. It’s unusual to regret putting on the rope, and this was no exception, as a turfy corner was steep enough to need some serious arm power. Next tier was Steve’s lead and a corner looked hard, although well enough protected. As he got stuck in, it was obvious that the slabby right wall was totally smooth whereas the left with the crack was slightly bulging. This forced a foot on to the right wall but only for balance and not to take any weight off his arms. A helpful chockstone meant he made good progress except we had no big cams and so the chockstone needed to be threaded. The gloves were off and after a tiring age, it was threaded and clipped. A reach up and a quick placement of the axes brought immediate movement and a pull on to a ledge which seemed more comfy than it looked, as his head disappeared into a hole leaving only his legs sticking out. But once he threaded another chockstone, he moved quickly up to a bigger ledge left of the top of the corner. Above was a groove hidden to me, but he soon told me it was an unprotected wide crack. But an unexpected ledge led left to an easier but very exposed grassy fault and soon a belay ledge. ‘We must be up to the halfway rake,’ Steve suggested, but actually it was two more pitches until we could reach the upper section with the Tower itself. Making a decision to get my opinion in first, I pointed out that the Tower looked like The Hurting, and by implication I didn’t want to go there. This comparison seemed to work, possibly helped by recent pictures on Ines Papert on the route, and Steve set off up a corner on the right and formed by the Tower. We were moving together but a difficult move off an undercut ledge slowed him down enough to belay, fortunately above it. I then regained the crest and kept going with the assumption that Steve was climbing too, until I ran out of steam. A final extended pitch led to the top, with the upper section somewhere around III,5. Overall we graded it V,6 but the crux was no soft touch. This entry was posted in New Routes and tagged Andy Nisbet, Ben Hope, Steve Perry. Bookmark the permalink.